George started sneezing in November 2013. It’s now April 2015 and he is still sneezing. 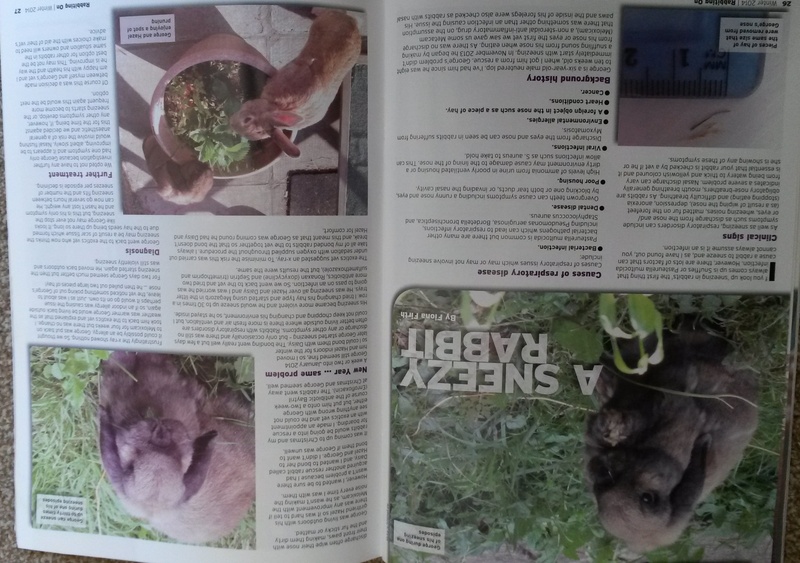 His story was published in the Winter 2014 edition of Rabbiting On (an excellent magazine that you receive quarterly if you’re a member of the Rabbit Welfare Association & Fund). At the time of publishing we had tried several different types of antibiotics, changed his environment and the litter being used in the trays, had an x-ray and pulled some hay from his nose. However, nothing seemed to help. 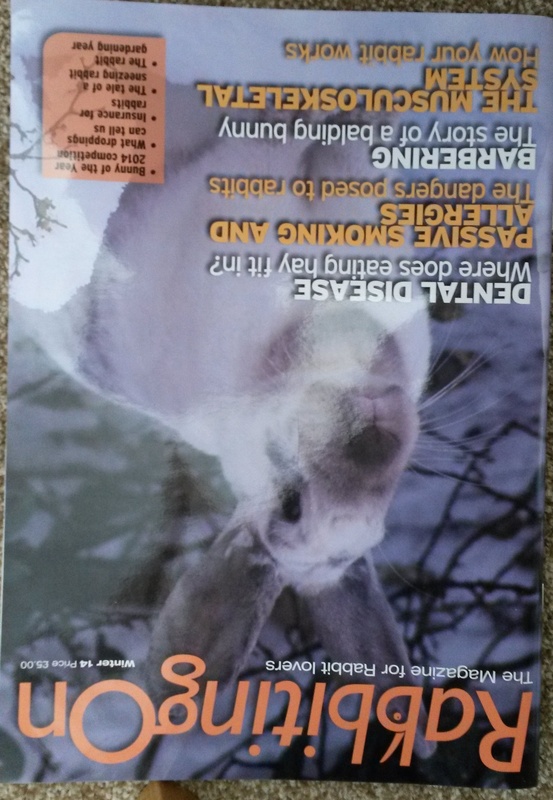 In November 2014, I decided to take him to Great Western Exotics Vets (yes, rabbits are classed as exotic pets!) where he spent a day having a few procedures. I took Hazel and Daisy (as I always do) to keep him company and made sure they all had their favourite tasty food ready and that the staff knew they liked water out of bowls not bottles. Due to the fact he has a respiratory problem he was sedated as it was too risky to anaesthetise him properly. He had a CT scan (expensive! lesson learnt about getting insurance) and swabs of his nose were taken. A few days later we had the results of the CT scan and swabs. His nose did show fluid but the swabs could not pinpoint any single pathogen so we were still none the wiser regarding what drugs to use. He had a mark in his lungs which possibly pointed to a previous issue such as pneumonia and a dental spur was also found but as George is still eating and not losing weight we just have to keep an eye on him. He is a poor hay eater in comparison to the girls so I have to be careful not to give him too many tasty things or he refuses to eat the hay. 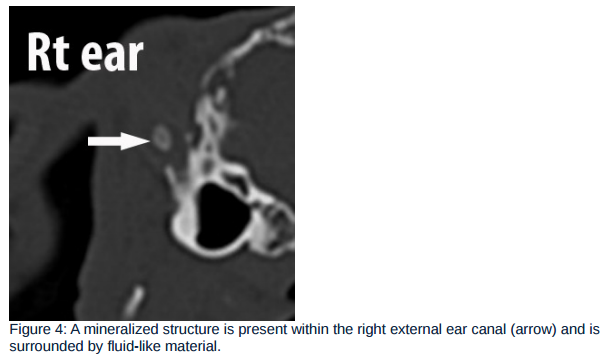 What I wasn’t prepared for was that he had infections in both his ears (poor man) and a polyp in one ear. The vet explained that lop eared rabbits are basically the Pug’s of the rabbit world (bred for looks rather than health) and their flat faces and floppy ears cause all sorts of problems. Lop eared rabbits many more problems because the air cannot circulate and dirt gets trapped inside them. We were given more antibiotics, a mucolytic (Biosolvon) to try and get him to sneeze out the stuff in his nose and some ear drops. The vet also advised ALL owners of lop eared rabbits should ear clean regularly (once or twice a week). A check up after two weeks showed his ears were clear again. I was given other options to try and establish what was in his nose. This included more nasal swabs or a fine needle aspiration into his lung. Unfortunately, both meant risky anaesthesia and there was no guarantee that we would get a definitive answer. I opted not to put him through any more procedures. Several months later (the sneezing never stopped) and I felt that his breathing sounded a bit ‘snotty’. We went back to the vets in March 2015 where he confirmed his lungs were clear (good news) but that he did still have issues with his nose. We got more antibiotics (penicillin this time) which I had to inject daily for 14 days and the vet suggested a nebuliser to manage the problem as at this stage it is a chronic condition. He gave me some F10 disinfectant mixed in distilled water and I bought a nebuliser from here. I highly recommend this company as I ordered Thursday morning and it arrived Friday morning (and was much cheaper than the website the vet suggested). You can also get nebulisers from Boots and other online chemists. Here is a video of George and his nebuliser, as you can see it doesn’t bother him much. To start with he was getting nebulised twice a day for 20 mins, then we reduced to once a day and now it’s a few times a week. Fingers crossed we can manage it and he will live a long life yet.